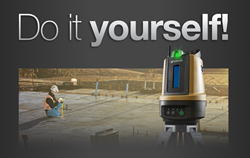 Topcon Positioning Group announces a hands-on seminar program coming to major cities in the U.S. and Canada. The LN-100 Layout Navigator Tour, Think Outside the String Lines: A Hands-on Seminar, introduces the one-operator system designed to perform construction and BIM layout functions. “The message is ‘do it yourself’ because that’s flexibility the LN-100 really offers operators,” said Brice Walker, vice president of survey sales. “It provides an entry-level precise measurement solution for diverse 3D layout applications, without the expense of a total station. The program is divided into two free half-day sessions that include lunch, with continuing education credits available. The second day focuses on advanced workflow techniques, with incorporation of Autodesk Point Layout in Revit, AutoCAD and Navisworks for model-based job site layout, as well as quality assurance and quality control using the latest technology. Nine cities remain on the tour with stops in Atlanta, Georgia; Washington, D.C.; Philadelphia, Pennsylvania; Pittsburgh, Pennsylvania; Columbus, Ohio; Chicago, Illinois; Phoenix, Arizona; Vancouver, British Columbia; and Portland, Oregon.